A year-long test of internet speeds in 189 countries has found the Chinese mainland comes in 134th at 1.55Mbps, just behind Iran and just ahead of Mauritania. The analysis was done by Cable.co.uk, a British broadband comparison service, using data from 63 million tests collected by M-Lab, a partnership between New America’s Open Technology Institute, Google Open Source Research, and Princeton University’s PlanetLab. In first place was Sweden with a mean download speed of 55.13Mbps, way ahead of second place Sweden at 40.16Mbps which was itself a good deal faster than third place Taiwan at 34.4Mbps. Hong Kong (27.16Mbps) came in ninth ahead of Switzerland (26.93) meaning out of the world top ten, three countries were in Asia, seven in Europe. South Korea, often thought to be the fastest, ranked 16th (22.9), yet was still many times faster than China’s 1.55Mbps, where 92,226 tests were carried out to arrive at that figure. War-torn Yemen came last at 189th with a mean download speed of just 0.34Mbps. 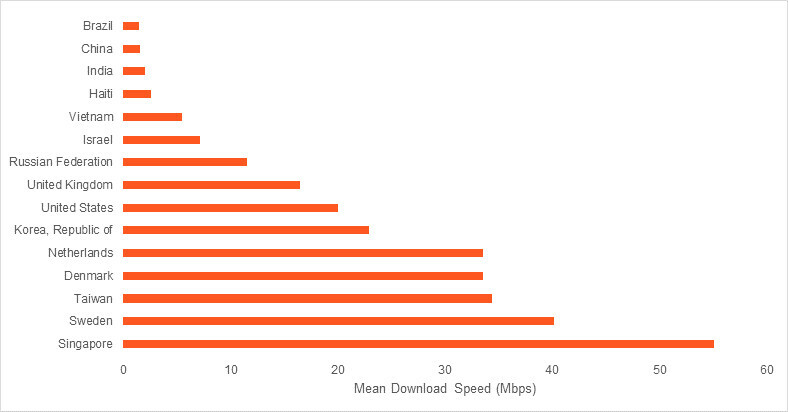 The data shows how long it would take to download a 7.5GB film in each country. In Singapore you’d need just 18 minutes and 34 seconds, while to download that same film in China would take 10 hours 58 minutes and 57 seconds. The report has created much consternation on Chinese social media, and something of a stir worldwide. Regional rivalries have been quick to surface with mean download speeds yet another reason for international one-upmanship. For a roundup, see Cable’s page where they seem somewhat taken aback by the response.